For BackupAssist 10 or later. The backup job failed to upload the backup catalog. The backup catalog lists the backups content and is needed for restoring data from the backup. One copy is stored locally and another copy is sent to the backup destination for safety. If this is the first time this error has occurred, there is no problem because you still have the main local copy of the catalog if you need to perform a restore. However, if this error persists, you should contact BackupAssist technical support to identify the best way to proceed. To contact BackupAssist technical support and provide diagnostic information, please click on the applicable section below and follow the steps provided. Select Help from the menu at the top of the BackupAssist console. Select Contact Support ... from the drop-down menu. This will open the BackupAssist - Support dialog. Enter the details in the fields provided. Make sure the Submit system diagnostics to help with your query tick box is checked. This will zip your BackupAssist settings so technical support can review these specifically for your environment. 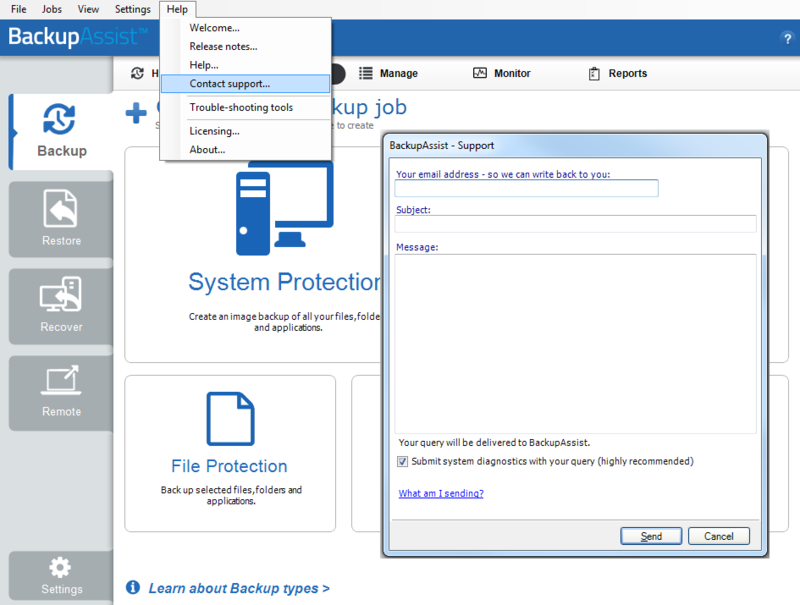 BackupAssist technical support will review your message and diagnostics, and contact you to help resolve the problem. Select Feedback and Support … from the drop-down menu. Select Contact support. This will open the BackupAssist - Support dialog.